This article is about the city. For the emirate, see Emirate of Sharjah. Sharjah (/ˈʃɑːrdʒə/; Arabic: ٱلشَّارقَة‎ aš-Šāriqah; Gulf Arabic: aš-šārja) is the third largest and third most populous city in the United Arab Emirates, forming part of the Dubai-Sharjah-Ajman metropolitan area. It is located along the southern coast of the Persian Gulf on the Arabian Peninsula. Sharjah is the capital of the emirate of the same name. Sharjah shares legal, political, military and economic functions with the other emirates of the UAE within a federal framework, although each emirate has jurisdiction over some functions such as civil law enforcement and provision and upkeep of local facilities. Sharjah has been ruled by the Al Qasimi dynasty since the 18th century. The city is a centre for culture and industry, and alone contributes 7.4% of the GDP of the United Arab Emirates. The city covers an approximate area of 235 km² and has a population of over 800,000 (2008). The sale or consumption of alcoholic beverages is prohibited in the emirate of Sharjah without possession of an alcohol licence and alcohol is not served in Sharjah hotels, restaurants or other outlets due to the Muslim majority in the area. This has helped Sharjah increase the number of Islamic tourists who visit the country. Sharjah has been officially named as a WHO healthy city. The 2016 edition of QS Best Student Cities ranked Sharjah as the 68th best city in the world to be a university student. Sharjah is regarded as the cultural capital of the UAE, and was the Islamic culture capital in 2014. Sharjah is the third largest city in the United Arab Emirates after Dubai and Abu Dhabi. The palace of the ruler of the Emirate of Sharjah, His Highness Sheikh Dr. Sultan bin Muhammad Al-Qasimi, is located about 20 kilometres (12 mi) southeast of the city. The city of Sharjah overlooks the Persian Gulf and has a population of over 800,000 (2008). It contains the main administrative and commercial centres together with an array of cultural and traditional projects, including several museums covering areas such as archaeology, natural history, science, arts, heritage, Islamic art and culture. Distinctive landmarks include two major covered souks, reflecting Islamic design, and a number of recreational areas and public parks such as Al Montazah Fun Park and Al Buheirah Corniche. The city is also notable for its numerous elegant mosques. The city of Sharjah is situated on the Persian Gulf coast of the United Arab Emirates. The emirate borders with Dubai to the south, Ajman and Umm Al Quwain to the north and Ras Al Khaimah to the east. It is the only emirate that overlooks the coastline on the Persian Gulf to the west and the Gulf of Oman (Indian Ocean) to the East, with the eastern Sharjah coastal towns of Kalba and Khor Fakkan. Sultan Al Omaimi, a UAE poet and researcher in folk literature, says that some historians speculate that Sharjah was the name of an idol worshipped in the ancient era which was known as Abed Al Shareq. Other researchers link the word Sharjah to the fact that the city is located to the east ('sharq' means 'east' in Arabic), of Dubai and Abu Dhabi. Sharjah was historically one of the wealthiest towns in this region with a settlement in existence for over 5000 years. In the early 18th century, the Qawasim clan (Huwayla tribe) established itself in Sharjah, c.1727 declaring Sharjah independent. On 8 January 1820, Sheikh Sultan I signed the General Maritime Treaty with Britain, accepting a protectorate to keep the Ottoman Turks out. Like four of its neighbours, Ajman, Dubai, Ras Al Khaimah, and Umm Al Quwain, its position on the route to India made it important enough to be recognised as a salute state (be it of the lowest class: 3 guns). "In the course of the night, we had passed the port of Sharjee, on the Arabian coast, which is not an island, as laid down in Niebuhr's chart, the only one in which it is inserted; but a small town, on a sandy beach, containing from five to six hundred inhabitants. It is situated in lat. 25° 34' north, and lies eleven leagues south-west of a small island, close to the shore, called Jeziret-el-Hamra; and three leagues south-west of Sharjee is Aboo Hayle." By the turn of the 20th century, Sharjah extended inland to the area now known as Wasit Suburb, the area between the city and Dhaid being under the control of the tribes of the interior. With some 15,000 inhabitants, Sharjah had some 4 or 5 shops in Layyah and a bazaar of some 200 shops in Sharjah proper. At the height of World War II, Nazi propaganda infiltrated the town. Loud transmissions of pro-Hitler speeches could be heard emanating from the Sheikh of Sharjah's palace during a period in 1940, and messages sharing a similar sentiment had been graffitied on walls in the town centre according to British intelligence reports at the time. Because the message being propagated by the Germans was one of anti-Imperialism, it found a sympathetic audience among the emirate's populace, particularly Abdullah bin Faris, a secretary of the Sheikh who was responsible for the broadcasts. After the Sheikh was confronted by the British, he wrote a letter reiterating his support for the British war efforts and disputed the charges laid out against bin Faris. Attached to the letter was a petition signed by 48 prominent individuals testifying to bin Faris' character, which, according to the British, had been misrepresented to the signees. The incident resolved after the Sheikh and bin Faris ceased from transmitting propaganda and doubled down on their support of the British. On 2 December 1971, Sharjah, together with Abu Dhabi, Dubai, Ajman, Umm Al Qawain and Fujairah joined in the Act of Union to form the United Arab Emirates. 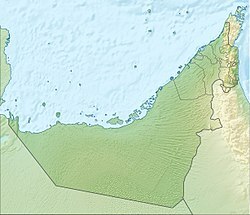 The seventh emirate, Ras Al Khaimah, joined the UAE on 10 February 1972, following giant non-Arab neighbour Iran's annexation of the RAK-owned Tunbs islands. Like the other former Trucial States, Sharjah's name is known by many stamp collectors because of the large numbers of stamps that were issued by the Sharjah Post Office shortly before the formation of the United Arab Emirates, which became part of the class of virtually worthless stamps known to collectors as Dunes. Many of these items feature subjects unrelated to the emirates whose names they bear, and therefore many catalogues do not list them. Named after the large rolla (banyan tree) that once stood in the square and that inspired the sculpture currently at the centre of the park, Rolla Square is a common location for workers to stroll during the weekends. Sharjah Fort was demolished in the 1970s but rebuilt and is today a museum. Located between the Blue Souq and Fish Market, near the Union Bank Tower, the floral call to cheer up etched on the roundabout has lent its name to the roundabout itself. The Souq Al Markazi, or Gold Souq, is a tourist destination and comprises a gold souq, clothing souq and, on its first floors, antiques and jewellery shops. The fort was built to house travellers on the Imperial Airways Eastern Empire route and was the site of Sharjah Airport until 1977. It is now an aviation museum. The Heart of Sharjah houses several galleries, and museums including the charming heritage museum which gives a great insight into the cultural traditions of the past. The area is also home to the traditional Souk Al Arsa, a covered souk with an array of items to sell including antiques and the office of the Sharjah Centre for Cultural Communication where you can get info on Sharjah attractions. The Sharjah Heritage Museum is situated near to the Bait Al Naboodah is just opposite Soouq Al Arsah. This is an architecturally designed two-storey family house. It is built around a shaded courtyard and is dedicated to a family life reconstruction many years ago. There are many rooms which has displays of traditional furniture along with household items too. Moreover, there are also provision of children's costumes, games and jewellery. Sharjah National park covers an area of nearly 270 thousand square feet of area. Located in Al Layyeh, Sharjah aquarium has over 250 species to see right from the delicate seahorses to smallest clown fish, reef sharks, rays and moray eels. Visitors can submerge themselves to the colorful, diverse and rich undersea world which is home to a variety of marine life which is native to the sea. Al Noor Island is located in the Khalid Lagoon and covers an area of 45,470 square metres. The destination project features art and light installations, including the 'OVO' and 'Torus' displays. The Arabian Wildlife Center opened in 1999 and is home to more than 100 species of animals. Situated at a convenient location, this center is quite close to the Sharjah International Airport. Despite the hot and dry conditions in most of Arabia, there are a number of mammal species who have adapted to these conditions. Al Majaz Waterfront is an expansion and beautification of the existing park in order to enhance it into a family-friendly leisure area, a waterfront landmark of Sharjah Featuring an audio-video dancing fountain, miniature golf and a number of restaurants. In 2018, the experiential art installation Rain Room was given a permanent home in Sharjah. Sharjah Art Foundation constructed a purpose-built visitor centre located in the city's residential area of Al Majarrah to house the permanent installation of Rain Room, with up to six visitors at a time taking fifteen minutes to explore the experience. Sharjah has a hot desert climate (Köppen climate classification BWh), with warm winters and extremely hot and humid summers. Rainfall is generally light and erratic, and occurs almost entirely from November to May. About two-thirds of the year's rain falls in the months of February and March. The city has reasonably well developed transport infrastructure. Like many major cities, Sharjah has a problem with vehicular traffic congestion during rush hours especially the roads leading to and from the Emirate of Dubai. The role of the Sharjah Public Transport Corporation (SPTC) is to reinforce public transportation, setting its policies and find strategic solutions for smooth traffic, providing modern and professional transport services to the passengers, driving Sharjah Emirate or on the InterCity routes, between all emirates in UAE. Development of transportation services in Sharjah is critical and long term task. Planning by SPTC since 2008 Sharjah Metro will be third in UAE (after Dubai and Abu Dhabi metros) and planning since 2015 Sharjah Tram will be second (after Dubai Tram). The Sharjah International Airport is the aviation hub of the city. Sharjah Airport is the third largest Middle East airfreight hub in cargo tonnage, according to official 2015 statistics from Airports Council International. Sharjah International Airport is home base of the low-cost carrier Air Arabia. It has daily flights connecting Lebanon, Jordan, United Kingdom, Netherlands, Ukraine, India, Egypt, Syria, Pakistan, Bangladesh, Saudi Arabia, Iran, etc. There are two major series of highways in Sharjah, which are "E" and "S". E represents roads connecting other emirates and S for roads within the emirates. E 88 - Al Dhaid Road connecting the Emirate of Fujairah. E 102 - Sharjah - Kalbah Road - Connecting Fujairha and Kalba. E 311 - Sheik Mohammad Bin Zayed Road - connecting Dubai, Ajman and RAK. E 11 - Al Ithihad Road - Connecting Dubai. S 12 - Maliha Road. Taxis in Sharjah are clean, well maintained and reasonable. Sharjah Public Transportation Corporation is organizing and supervising the operations of taxis in Sharjah Emirate. Sharjah taxi service is provided through franchise companies. They cover all parts of the Emirate and cities, including shopping centres, residential areas and airport. Following are the major taxi operators in the emirates. Sharjah Taxi: Area of operation - Sharjah City and Eastern Regions. Emirates Cab: Area of operation - Sharjah city. City Taxi : Area of operation - Sharjah City and Eastern Regions. Union Taxi: Area of operation - Sharjah city. Advantage Taxi : Area of operation - Sharjah City and Central Regions. Sharjah Transport Corporation also provides Sharing Transportation with the purpose of serving certain routes in Sharjah City on a fixed rate for each route without using the meter. Sharjah Sharing Taxi routes are carefully selected to support people with low income and are covering areas with frequent needs for quick transfer within same location, to ease the traffic situation in Sharjah. Sharjah Public Transport Corporation operates passenger bus services nationwide, between Sharjah City, Ras Al Khaimah, Khor Fakkan, Kalba, Fujairah, Masafi, Ajman, Umm Al Quwain, Hamriyah Free Zone, Dhaid, Al Madam, Dibba Al Hisn, Abu Dhabi, Al Ain and Dubai. Utility services in the emirate is provided by SEWA (Sharjah Electricity and Water Authority). They provide electricity, water and LPG connection to about 2 Million consumers in the emirates. Telephone services in the emirate both fixed lines and mobile services are provided by Govt owned Etislat and Du communication Ltd. The UAE culture mainly revolves around the religion of Islam and traditional Arab culture. The influence of Islamic and Arab culture on its architecture, music, attire, cuisine and lifestyle are very prominent as well. Five times every day, Muslims are called to prayer from the minarets of mosques which are scattered around the country. Since 2006, the weekend has been Friday-Saturday, as a compromise between Friday's holiness to Muslims and the Western weekend of Saturday-Sunday. The Ruler of Sharjah ordered the establishment of several cultural institutions. The projects covered conservation of cultural heritage, active interaction with other cultures, construction of museums and the other cultural, scientific and artistic centres in the Emirate and the setting up of a television satellite channel that reflects and projects the value of culture. In 1998, Sharjah was awarded the "Cultural Capital of the Arab World" title by UNESCO representing the United Arab Emirates. Sharjah has kept the spirit of its history alive by indicatively incorporating tradition into every aspect of contemporary development. A cultural heritage project, Heart of Sharjah, has been undertaken to preserve and restore the old town of Sharjah and return it to its 1950s state. A five-phase project intended for completion in 2025, the project is being undertaken by the Sharjah Investment and Development Authority, Shurooq, together with Sharjah Institute for Heritage, the Sharjah Museums Department, and the Sharjah Art Foundation..
Sharjah International Book Fair is a cultural event held every year in Sharjah. It started in the year 1982 and now it attracts publishers, readers and speakers from all over the world. Sharjah is the headquarters of Air Arabia, the first low-cost airline in the Middle East, which operates to the Middle East, Asia and Europe. The headquarters is in the Sharjah Freight Center, on the property of Sharjah International Airport. Sharjah Airport International Free Zone, popularly known as SAIF Zone, is one of the prominent free-trade zones in UAE. More than 6000 companies operates from SAIF Zone. The cost of setting up business in Sharjah is less than in any other emirates of UAE, and the focus of industrialisation has in recent years turned Sharjah into a commercial centre. Thanks to the facility of 100% foreign ownership, repatriation of capital and profits and exemption from income and corporate taxes, SAIF Zone has attracted investors from more than 90 countries. Hamriyah Free Zone: Established in 1995, it offers competitive and unique opportunities to establish business in a tax-free environment, full company ownership, exemption from all commercial levies and repatriation of capital and profits. The Free Zone provides access to a 14 meter deep water port and a 7 meter deep inner harbor. According to 2015 census conducted by department of statistics and community development in Sharjah, the total population of the emirate is 1.40 Million. Expatriates constitute 87% of the total population. As per the census the total number of Emirati population is only 175,432. The population density of the Emirates is 341 person per km2. Like the rest of UAE, Arabic is the official and national language of the emirate. 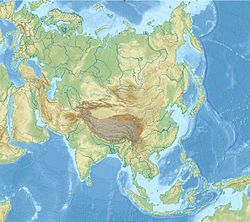 English is used as a second language; Tagalog and South Asian languages such as Hindi, Urdu, Malayalam are spoken widely by the residents of emirates. Islam is the predominant religion in the Emirate of Sharjah. There are several public and private schools in addition to universities in Sharjah, including the University of Sharjah, American University of Sharjah, Skyline College Sharjah, Westford School of Management, Exeed School of Business and Finance Sharjah Men's College, and Sharjah Women's College. Some of these universities are located in one area called the University City. Private schools in the city include the Sharjah Indian School, Sharjah English School, Emirates National school, American Community School Sharjah, Indian School Sharjah, the International School of Choueifat, Sharjah, Sharjah High School, DPS Delhi Private School, Gulf Asian English School, Our Own English High School, And American school of creative science. The Sharjah Cricket Stadium has hosted almost 218 cricket One Day Internationals, more than any other ground, and 4 Test matches. Football clubs include Al Sharjah and Al-Shaab in the First League, and Al Hemriah, Al Khaleej and Dibba in the 2nd league. Sharjah also has a chess club. Also, the organisers of Sharjah Grand Prix host the Formula One World Powerboating Championships every year at Al Buhaira Corniche, Sharjah. In 2005, it was held under the patronage of Shaikh Sultan Bin Mohammad Bin Sultan Al Qasimi, Crown Prince and Deputy Ruler of Sharjah. The Buhairah Corniche has numerous upscale hotels. The Sharjah Commerce Tourism Development Authority is also located along the corniche. ^ Qafisheh, Hamdi A. (1997). NTC's Gulf Arabic-English dictionary. NTC Publishing Group. p. 351. ISBN 978-0-8442-4606-2. ^ "About Sharjah". This is sharjah. Archived from the original on 2 March 2015. ^ "Sharjah's tourism focus is all about Islamic culture". The National. 17 December 2013. Retrieved 24 February 2015. ^ "QS Best Student Cities 2016". topuniversities.com. 30 November 2015. Retrieved 12 April 2017. ^ Reporter, Jumana Khamis, Staff (23 November 2013). "Sharjah, the cultural capital of the UAE". gulfnews.com. Retrieved 12 April 2017. ^ "2014 is Sharjah's Islamic Culture Capital year, and it will be a busy one for Sheikh Sultan - The National". thenational.ae. Retrieved 12 April 2017. ^ "Al Qasba". alqasba.ae. Archived from the original on 30 April 2017. Retrieved 12 April 2017. ^ "Sharjah, the third largest and most populous city in the United Arab Emirates. | FV Travels". fvtravels.com. Retrieved 26 May 2018. ^ "The Report: Sharjah 2008". Oxford Business Group. 2008. p. 136. ^ James Silk Buckingham (1829). "'Travels in Assyria, Media, and Persia, [...]'  (507/582)". Qatar Digital Library. Retrieved 10 January 2019. This article incorporates text from this source, which is in the public domain. ^ Lorimer, John (1915). Gazetteer of the Persian Gulf Vol II. British Government, Bombay. p. 1762. ^ Louis Allday. "Nazi Propaganda in Sharjah during World War II". Qatar Digital Library. Retrieved 10 January 2019. ^ "Sharjah & Dependencies Stamps and Postal Stationery Site". Ohmygosh.on.ca. Retrieved 18 November 2012. ^ Carlton, R. Scott. The International Encyclopædic Dictionary of Philately. Krause: Iola, 1997, page 173. ^ Al Qasimi, Sultan (2011). My Early Life. UK: Bloomsbury. p. 21. ISBN 9781408814208. ^ Sharjah Art Foundation. "Sharjah Art Foundation - Smile, You're in Sharjah, 2009". Sharjahart.org. Archived from the original on 4 March 2016. Retrieved 2 May 2016. ^ "Climate Normals for Charjew". National Oceanic and Atmospheric Administration. Retrieved 10 February 2013. ^ Zain, Asma Ali. "Sharjah eyes its own metro". www.khaleejtimes.com. ^ Reporter, Ashfaq Ahmed, Staff (13 March 2009). "Sharjah mulls Metro system to beat traffic". ^ Deulgaonkar, Parag (3 September 2015). "Tram in Sharjah: Where is it being built... click to know". Retrieved 4 June 2017. ^ Jonathan Sheikh-Miller. "UAE Weekend Switchover". AMEinfo. Archived from the original on 12 February 2011. Retrieved 22 March 2010. ^ "Sharjah, the Cultural Capital of the Arab World Centro Sharjah". www.rotanatimes.com. Retrieved 21 June 2015. ^ Morgan, James. "UAE: Heart of Sharjah on track to complete by 2025 | ConstructionWeekOnline.com". www.constructionweekonline.com. Retrieved 3 December 2018. ^ "Contact Info". Air Arabia. Archived from the original on 20 October 2012. Retrieved 18 November 2012. ^ "Low cost & regionals: Arabian pioneers". Flightglobal.com. 23 April 2007. Retrieved 18 November 2012. ^ "Hamriyah Free Zone". Business-Dubai.com. Retrieved 22 November 2015. ^ "Sultan attends signing of Sharjah-Granada sister city agreementUAE – The Official Web Site – News". Uaeinteract.com. Archived from the original on 5 August 2012. Retrieved 18 November 2012.